Paint problems don’t get nearly as much coverage as they deserve but just like Nuns and Clowns, they do exist. 2 Responses to Paint problems don’t get nearly as much coverage as they deserve but just like Nuns and Clowns, they do exist. 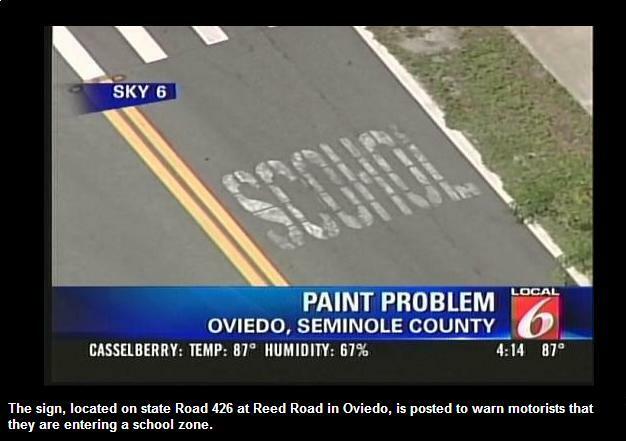 Perhaps we should make the people in charging of painting streets take a spelling test before they get this job. Yes, that would work. Agreed, we’ll make them take a spelling test. As long as those in charge of the spelling test can spell, we should be fine. What happens if those in charge of the spelling test, can’t spell?